A group of colorful butterflies were sighted approaching threatening the head of some turtles while trying to drink their tears! According to a report, the orange butterflies Julia and the yellow Sulphur need the nutrients contained in the tears of turtles to live. In the tropical forests of the Amazon there is another easily accessible source of sodium resulting butterflies to resort to this solution: drink rich in salt tears of turtles. 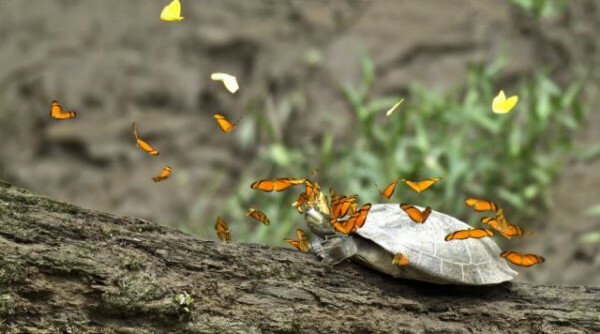 The photographer Jeff Cremer and biologist Phil Torres managed to immortalize the moment in the Tambopata region of Peru, saying that they had never seen so many butterflies gathered over a turtle. It seemed very funny. 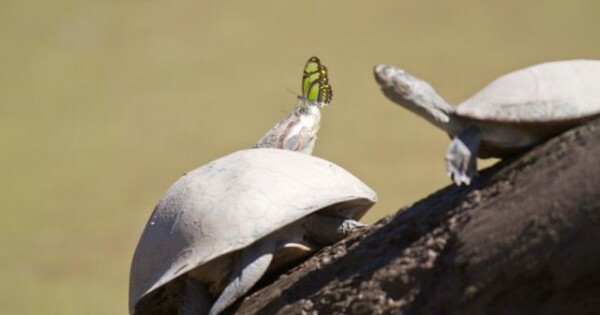 We are used to seeing one or two butterflies onto a turtle but this time he had gathered a great bunch, said Cremer. The freshwater terrapins turtles had come ashore to enjoy the sun and gather heat and energy, when surrounded of butterflies. The departing from the Atlantic, the scarcer the resources one can find salt. So there are such strange phenomenons in turtles and caiman, said Torres. The turtles do not seem to be bothered by the butterflies and wait patiently for them to drink their tears, although they are not so comfortable when bees approach. They shake their heads while trying to drive out the bees, he added. He does not believe that there is mutual benefit for both species of butterflies for example to clean the eyes of the turtles. Butterflies benefit and turtles are not affected at all. Butterflies do everything to find some salt in these environments. They can come in your sweaty shirt, or if you lie down with your eyes open, he concluded.